An academy more ephemeral than Kaplan University, the body of movie-industry workers who vote for the Oscars acted with rare judiciousness this week and made only two nominations—the lowest number in Academy Award history—for Best Original Song. To qualify, a tune must have been composed especially for the film in which it appears, and it must play within the body of the movie or immediately at the end. (If a film has more than one song during the closing credits, only the first of them qualifies for a nomination.) Last month, the Academy of Motion Picture Arts and Sciences released a short list of thirty-nine qualifying songs, most of them musical numbers from kids' films (such as "Love Builds a Garden" from Gnomeo and Juliet and "Bridge of Light" from Happy Feet Two) or grand, mushy "love themes" (such as "Lay Your Head Down" from Albert Nobbs and "Rainbird" from Dirty Girl, which are musically interchangeable). 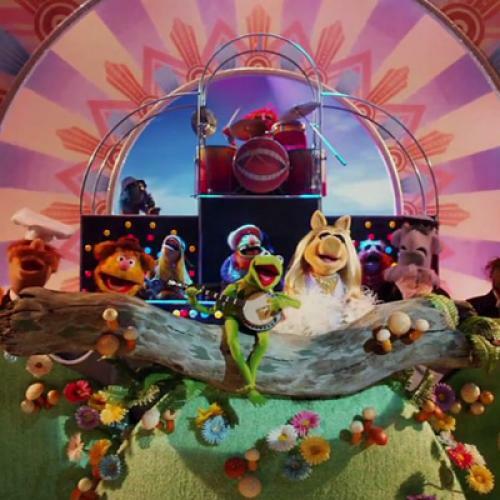 Out of the thirty-nine, the only songs to receive scores high enough to earn nominations are "Real in Rio," written by Sergio Mendes for the cartoon romance Rio, and "Man or Muppet," by Bret McKenzie for Disney's franchise reboot, The Muppets. Neither song is very good. But, in Oscar season, "best" is more relative a term than usual. The other thirty-seven songs are no better. Established in 1934, when the nominated tunes all came from the budding genre of movie musicals (The Gay Divorcee, Flying Down to Rio, and the aptly forgotten She Loves Me Not), the Best Original Song award is an artifact from the time when people got nearly all their entertainment at the movies and expected to get every kind of entertainment while they were there—thrills, romance, comedy, and songs. By the 1940s, the most esteemed composers in popular music—Irving Berlin, Jerome Kern, George Gershwin, Cole Porter, Harold Arlen, among others—were all writing original songs for film, and the Oscar nominations for Best Song went to tunes that soon came to be regarded as standards: Berlin's "Cheek to Cheek," the Gershwins' "They Can't Take That Away from Me," Porter's "I've Got You Under My Skin," Arlen and Yip Harburg's "Over the Rainbow." With the exception today of animated features, which carry on the tradition of movie musicals as kitsch for kids, films have no need for songs except as marketing tools—mechanisms of cross-promotion and free publicity on Youtube. The songs that cue up now with the end credits and vie for Oscar nominations tend to sound like what they are: marketing passing for music. Of course, there have always been bad songs in contention for Oscars: years ago, piff like "Silver Shadows and Golden Dreams" and "Sleighride in July"; and more recently, the pandering things like "Almost There" and "We Belong Together" that the otherwise great and important Randy Newman blurts out every few years on contract. Moreover, some of the most memorable songs in Oscar history have appeared in movies best forgotten, such as Harold Arlen and Johnny Mercer's "Accentuate the Positive," which made its debut in a performance by Bing Crosby in blackface in the wartime trifle "Here Come the Waves." Duck your head.